Ubisoft is calling it Project Legacy, but the newly launched Facebook training simulator for Templar front company Abstergo Industries is as Mafia Wars as they come. Use your action points to complete memories, earning experience points and money in the process. Some missions require items you can either buy or earn through other missions. Completing missions unlocks more missions. Completing all missions in a memory unlocks more memories. That's Project Legacy in a nutshell. It's very Mafia Wars, but it also manages to improve upon Zynga's social mob simulator on several levels. For instance, if you need and item for a mission and don't own it yet, you can purchase it directly from the mission screen. If you need an item that you earn in another mission, you click a button to go to that mission. Once you have the item, hit back and you return to the previous mission. 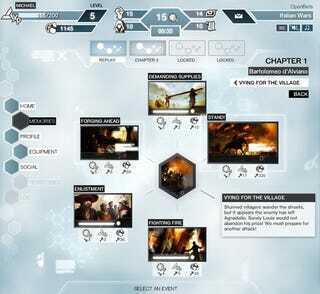 The whole thing is presented in the form of an Abstergo Industries training simulator. As you begin the game you are asked a series of questions. Once you finish answering them, you proceed to the Animus, where you'll relive key moments in Templar history through the eyes of your ancestors. You'll have to complete missions multiple times to synchronize them, but as you do a story actually unfolds in the mission window, which is more than what generally happens in Mafia Wars. As an added bonus, players will be able to earn Uplay points through the game, which can be redeemed for rewards in many of Ubisoft's latest releases. As Mafia Wars type games go, it's a rather slick example. See for yourself by playing Project Legacy on Facebook right now.